The election is scheduled for 27 March. 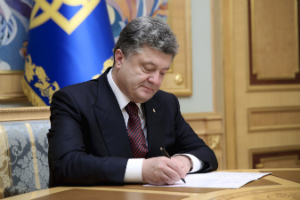 Ukrainian President Petro Poroshenko has signed the law on repeat mayoral election in Kryvyy Rih, his press secretary Svyatoslav Tseholko has said. According to Tseholko, the extraordinary election will be held on 27 March. Yuriy Vilkul has won the regular election for Kryvyy Rih mayor with 89,209 votes, followed by Yuriy Myloboh, a candidate of the Self-Help party, who scored 752 votes less. Although Vilkul even took office on 18 November, Myloboh did not admit the defeat and complained about election fraud. Public protests followed and pushed parliament to vote in favour of a repeat election.